The brooch is a bit scary. But the outfit is amazing! She seems to have a super-mom cape herself. What a horrible brooch, I get creeps. They must have a very big collection of these insert brooches in Dutch vaults. She knows how to wear this pantsuit, it suits her. Hair and brooch? Not nice really. i cant take my eyes off that brooch!!! Her hair gets worse by the day. The scarab brooch means what? Now more beetle and spider brooches, please, she is overdoing that thing. Although I am not a fan of jumpsuits, she knows how to wear them. I always look at the way she interacts with people - truly amazing. Clothing a minor detail. I always look at the way she interacts with people - the best. She is very comfortable in whatever she wears ! 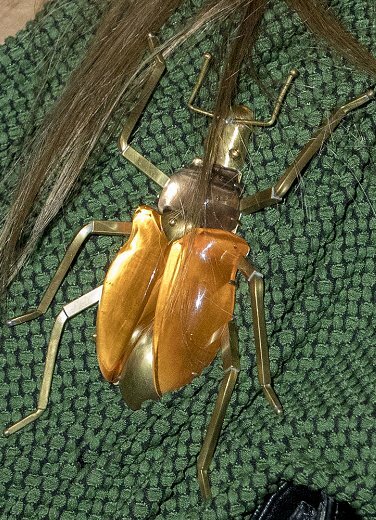 Gorgeous color but why another bug brooch?! The brooch is just horrible. The outfit is just okay. The hair is not nice at all. Nothing new. I'm amazed that she thinks it's a flattering style. Not my taste, yes, the color maybe, but it looks like curtains. And since that China visit, when she fell ill, she has to do something about her hair. Still a renal-problem or Menopause? I would choose a nice chin-length bob. Would suit her. The brooch is toooo much. Someone is getting ready for St Patrick's day! I can't think of much I like...the color is OK but way too much of it. Hair is getting worse, the brooch leaves me speechless. She certainly building up a collection of bug brooches. We've had butterflies, a spider, and now a massive bug ! No need to worry as long as it's not a black widow spider. Ha! She's great, having fun in life. Bravo for her style.